One of the most important missions of the National Grocers Association (NGA) is to ensure the federal policies enacted help independent grocers continue to grow, employ workers in their communities, and better serve their shoppers. Our goal is to help members spend more time running their business and less time attempting to comply with an ever-growing list of onerous regulations. Throughout the past year, we’ve doubled down on our efforts to expand the voice of the independent supermarket industry in Washington—before Capitol Hill, the Administration, and federal agencies—at a crucial time. In January, we brought on Mike Gleeson as director of government relations to help bolster our efforts on tax policy, who served as tax counsel for Congressman Jim McDermott (D-WA). Most recently, Chris Jones, former legislative director for Congressman Rick Crawford (R-AK) rejoined the team as vice president of government relations and counsel to oversee our day to day lobbying efforts, while also focusing on addressing regulations impacting our industry. The 2014 Farm Bill is set to expire in 2018 and lawmakers have already begun holding hearings to receive input from stakeholders on what’s important for the legislation’s reauthorization. Single-store operator Jimmy Wright, one of 10 retailers to be selected for the launch of the SNAP Online Purchasing Pilot, recently testified before the Senate Agriculture Committee on behalf of NGA. In his testimony, he spoke about the importance of the pilot program, urged the committee to reject proposals threatening to restrict what foods SNAP participants can purchase with their benefit, and create a more streamline process for SNAP license application process.? Right before the menu labeling rule, a regulation meant for chain restaurants that ended up covering chain supermarkets in the FDA’s final rule, was scheduled to be implemented, NGA & NACS filed a citizens’ petition that successfully delayed enforcement date for another year. NGA is also working to build support for the Common Sense Nutrition Disclosure Act (H.R. 772), which recently passed out of the House Energy and Commerce Committee.? The debit swipe fee reform that was passed as part of the 2010 Dodd-Frank Wall Street Reform and Consumer Protect Act helped prevent Big Banks from price-fixing debit interchange fees while also bringing competition back to the debit routing marketplace, but was included in the Rep. Jeb Hensarling’s (R-TX) bill to undo the legislation. NGA worked to successfully remove the provision from the repeal measure, which would have increased debit swipe fees by a staggering 200 percent.? The average independent grocer spends between $40,000-$50,000 annually on regulatory compliance. To help illustrate how the increasing number of regulations forces supermarkets to reallocate resources previously used for store improvements, additional staff, and expanded offerings, Carlos Castro, president of Todos Supermarket, testified before Congress on behalf of NGA. During his testimony, he highlighted how the overwhelming number of regulations are preventing small businesses from growing.? As Congressional Republicans and President Trump look to overhaul the outdated tax code—which hasn’t been updated in over 30 years—NGA has been discussing the independent supermarket industry’s priorities for tax reform. In July, we shared those priorities before the Administration during a listening session at the White House and successfully worked alongside stakeholders urging lawmakers to reject the border adjustment tax (BAT). In September, members of our government relations committee also met with White House officials to discuss tax reform. 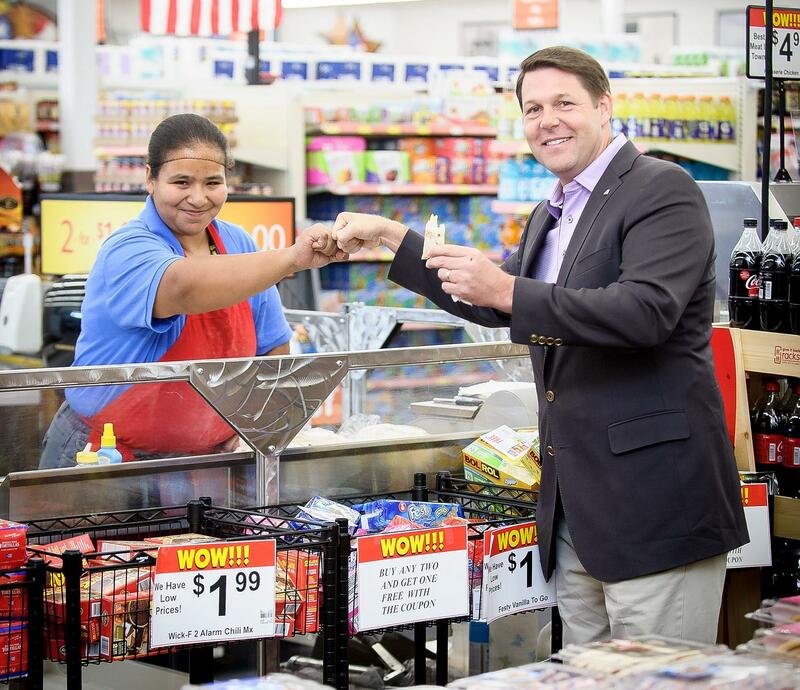 During the August district work period, NGA also helped coordinate 10 store tours with Members of Congress in independent supermarkets to learn more about what it takes to run a store and the economic impact the industry has in the communities they represent. Since January, NGA members have over 20 Members of Congress in their stores or distribution facilities. With so many issues that could affect America’s independent grocers, giving the industry a bigger voice in Washington has been an important piece of NGA’s advocacy work. We’re proud to help shape policies that will help the independent supermarket industry thrive in the communities they serve and, ultimately, impact most stores’ bottom line. To receive the latest information on NGA’s public policy initiatives and what’s happening in Washington, click HERE to subscribe to NGA’s weekly Capitol Checkout e-newsletter.